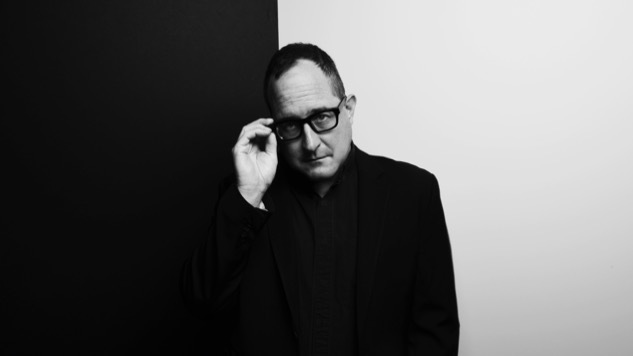 I’m not the only music critic who has compared the Hold Steady’s Craig Finn to Bruce Springsteen, and the linkage between these rock ‘n’ roll chroniclers of working-class struggles is hard to ignore. But when Finn brought his new solo album, We All Want the Same Things, to Baltimore’s Canton Waterfront earlier this month, I realized the better comparison might be Elvis Costello. The visual clues were unmistakable. With his black blazer, black-frame glasses and receding dark hair, Finn resembled the former Declan McManus—even more so when he staggered stiff-legged across the stage and shot his arms out of his sleeves like a vaudeville comic. But when Finn sang “Jester & June” from the new album, the connection to Costello seemed authorial as well as sartorial. This is a song about crime with no heroes. The title couple are hiding in a bathroom stall, waiting for a drug dealer to come in and slip a Ziploc bag under the trashcan. If that weren’t humiliating enough, when they retrieve the bag, it contains nothing but coriander. So they give some money to the kid at the car wash, but they never see the dope, the money or the kid again. They’re “the only people waiting at the car wash in the rain” when the cops show up, shining flashlights in their eyes and jangling their handcuffs as they ask hard-to-answer questions. Backed with a rumbling, sour sadness by his new side-project band, the Uptown Controllers, Finn sang the song with a crispness and clarity that were often lacking in Hold Steady’s guitar-noisy live shows. Assuming the character of Jester, the song’s narrator, he described all the characters—the scumbag dealers, the pushy cops, even the hapless lovers—as unattractive losers, pushed into their roles by a pitiless fate beyond their control. These songs echo the film-noir approach to crime: the assumption that crime is not the battle between amoral criminals and noble cops protecting innocent victims but rather an arena where the worst impulses of every participant can emerge. Those black-and-white movies such as Double Indemnity, The Big Sleep and Touch of Evil are brilliant works of art, but they are not flattering portraits of human nature. Neither the criminals nor the cops can trust their colleagues, much less their opponents; even the good-guy private eyes or reporters can be beaten, jailed or sidelined. In 2012, the United Nations estimated that crime is 3.6 percent of the global economy, and yet crime and crime-fighters constitute nearly half of the dramas on the big screen and small. Why is crime so over-represented in the narrative arts? Are we that fascinated by getting something for nothing and shooting anyone in our way? That’s definitely part of it, but crime stories also allow us to explore two major tendencies in modern society—laissez-faire capitalism and the libertarian philosophy that underpins it—in the entertaining form of capers and gun battles rather than the less entertaining form of wage cuts and price increases. After all, what are criminal gangs but capitalist organizations who defy any attempt at regulation in the pursuit of profit? And who better represents the corrupted regulators of capitalism than ineffectual police departments? From the film-noir classics of Howard Hawks and Billy Wilder to the Mafia masterpieces of Francis Ford Coppola and Martin Scorsese, we find illuminating analogies for our real-life, Ayn-Rand-justified, dysfunctional society. Unlike film, television and fiction, however, popular music has only occasionally employed crime stories as subject matter—and more rarely yet in the anti-hero approach of film-noir. Country singers can celebrate Old West Outlaws, and rappers can celebrate modern-day drug dealers, but how many musicians have been willing to portray criminals and lawmen alike as amoral actors? Artists such as Costello, Curtis Mayfield, Lou Reed, Randy Newman, James McMurtry, Kendrick Lamar, Nick Cave and even Springsteen have made stabs at it, but no one has adopted it as a major theme. It’s easy to understand why. The bleakness of film-noir requires a patient build-up of narrative detail, and the brevity of pop songs makes that difficult. The few successes have often relied on a musical version of the film-noir narrator—that droll, skeptical voice (often Humphrey Bogart’s) that drily relates every betrayal of idealism and conscience as if it were part of the daily routine. In song, this becomes a kind of operatic recitative, half-sung and half-spoken, that can cram in a lot of words over brooding music. The bleakness of film-noir requires a patient build-up of narrative detail, and the brevity of pop songs makes that difficult. The few successes have often relied on a musical version of the film-noir narrator—that droll, skeptical voice (often Humphrey Bogart’s) that drily relates every betrayal of idealism and conscience as if it were part of the daily routine. In song, this becomes a kind of operatic recitative, half-sung and half-spoken, that can cram in a lot of words over brooding music. On the Hold Steady records, Finn did this as well as anyone, and on his past two solo albums (2015’s Faith in the Future and this year’s We All Want the Same Things), he has done it even better than that. His criminals are not glamorous gangsters but rather low-life hustlers as intoxicated and incompetent as their victims. No one comes out looking admirable in Finn’s Bogart-like voiceovers, but he sets scenes and unspools plots with vivid realism. On the rock reverie of “Rescue Blues,” Jamie, the pretty woman from the grocery store up on Grand Avenue, admits she owes “some money to some other guys; it’s best if I stay inside.” So they watch crime shows on TV where “the heroes somehow always end up fine.” It’s unlikely that the same will be true of Jamie. In “Ninety Bucks,” an old friend calls up and says she needs that much money right away to pay off her dealer. “If I’m short when he shows up,” she explains over the push-and-pull garage-rock, “he’ll be pissed, because credit is something he don’t do. Cash is king and three for two. I’ve seen him use his hands to make a fist.” The listener is put in the position of the old friend: You can’t approve of her choices, but what are you going to do? Deny her the 90 bucks? Here’s a model for how rock-noir can be done right: the deadpan narration, the ominous soundtrack, the unflinching depiction of human nature detached from communal obligation. It’s difficult to believe that we’ll get a more powerful rock album this year than We All Want the Same Things, but it does not offer a reassuring picture of American society in 2017. We’re living in “the ruins of an empire,” Finn sings on “Be Honest,” “and the people we once were.” The old norms are gone, and it’s every man for himself. It’s unpleasant news, but it has the bone-tingling ring of truth.